This Special Health Report, A Guide to Men's Health Fifty and Forward, offers steps and strategies to lessen — or prevent — threats to a man's well-being and longevity. It provides a wide-ranging, clear-eyed look at the leading causes of death for men at midlife and beyond. It examines those factors that put them at risk for a variety of health problems and explains the important measures that can be taken to reduce risk and live a longer, healthier life. Men 50 and older: What you know can help you! Learn how you can protect yourself from age-related illnesses and add to your health, vitality, and peace of mind. Are you doing all you can — and should — to boost your defenses against those medical problems that can threaten your health, vigor, and longevity? Beginning around age fifty, a man's body starts becoming more susceptible to ailments and disorders that can derail health, happiness, and even life itself. 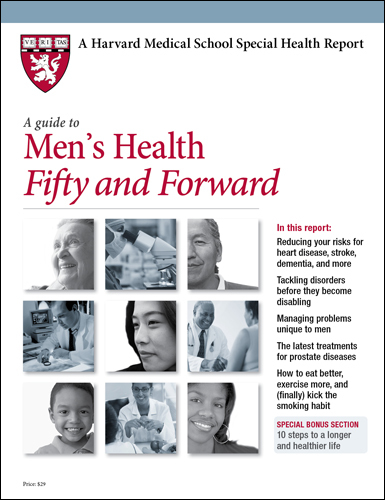 A Guide to Men’s Health Fifty and Forward, a Special Health Report from Harvard Medical School, offers steps and strategies to lessen — or prevent — threats to your well-being and longevity. It provides a wide-ranging, clear-eyed look at the leading causes of death for men at midlife and beyond. It examines those factors that put you at risk for a variety of problems and explains the important measures you can take to reduce those risks. You’ll also get useful guidance for protecting yourself against the effects of common age-related problems that can diminish the quality of life, including osteoarthritis, low back pain, hearing loss, enlarged prostate, and erectile dysfunction. A Guide to Men’s Health Fifty and Forward is filled with positive, practical information for strengthening your defenses to ensure a healthier, longer life. If you want to stay in the game — and on top of your game — order your copy of this Special Health Report now! What if men approached their health at midlife the way that financial experts advise them to plan for retirement? Some of the same rules apply. Take a close look at where things stand now, and then take steps to protect your future. If you’ve taken risks, it is time to start reducing them and instead invest in ways that are likely to pay benefits in the future. So how do you start investing wisely in your health? First, acknowledge what you can’t control. Then put your energies into changing what you can — for the better. 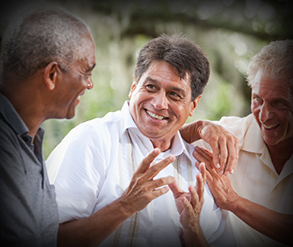 This report is intended to provide information about both approaches as it covers the diseases and conditions that most often jeopardize the lives — and quality of life — in men who are middle-aged and older. Although the report covers a variety of conditions, certain themes appear again and again. Even though you can’t change the following factors, you can take them into account while determining your risk for certain conditions. Knowing your risks may help motivate you to make the changes that you can. Age. As people grow older, their bodies undergo gradual physical changes that are normal and inevitable. Cells, for example, may become damaged by random genetic mistakes that occur as cells divide and DNA is improperly copied. Although your body has many built-in repair systems, sometimes these also break down, and over time the cellular damage accumulates. Family history. When an immediate family member— a parent or a sibling—develops a problem such as heart disease or cancer, it could mean that you are at risk as well. Shared genes explain some of this risk, but so do shared lifestyles, such as the food you eat and how active you are. It may surprise you to know that what you can control often affects your health much more than the factors you can’t control. For all the media coverage of new genetic discoveries, for example, the old tried-and-true advice about diet and exercise matters more in the end. There’s a saying, “Genes load the gun, and lifestyle pulls the trigger.” In other words, you can avoid activating many disease-promoting genes if you adopt healthy habits. Moreover, you can amplify the benefits of “good genes” with positive lifestyle choices. Here are some of the most important things to consider as you look at the health investments you want to make going forward. Whether you smoke. About one in four American men smokes cigarettes, pipes, or some other form of tobacco. If you are one of them, kicking the habit is the single most important thing you can do to improve your health. What you eat. Consuming a healthy diet on a regular basis is one of the best ways to reduce your risk of multiple, life-threatening illnesses, including heart disease, diabetes, and some of the most common cancers. How much you move. Get active, live longer. Not only that, but live better. Study after study has linked greater amounts of physical activity to improved mood, better blood sugar control, reduced risk of heart disease, and other benefits.